John Deere has updated its range of large square balers for 2015 with the introduction of two new models, the L1533 and L1534, which replace the 1433 and 1434 balers. Along with the current 1424 model, these new L1500 Series machines will provide customers in 19 European markets with enhanced performance, increased uptime and optimised cost of operation. Due to a reduced number of parts, the driveline design of the L1533 and L1534 requires less tractor hp and therefore helps to improve overall fuel efficiency. Also designed to increase the balers’ performance, the proven high-capacity feeding system features an inline rotor and augers to prevent plugging. Rotor options include RotoFlow HC and MaxiCut HC with 10 or 23 precutter knives. 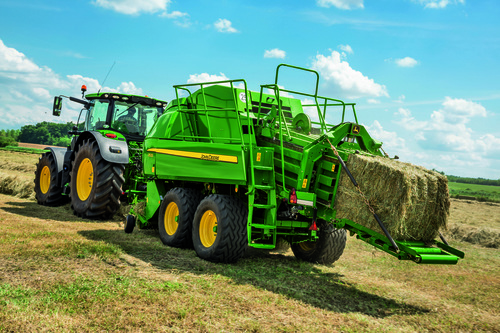 For optimum versatility and well-shaped bales, these new large square balers feature a multi-crop packer to handle silage, hay and straw. Key components including the pick-up, rotor, packer and the main gearbox are all fully clutch protected. To reduce the load on the knotters during baling and to achieve a high bale density at all times, the balers are now equipped with new double tie knotters. In addition, two new high capacity turbo blowers, originally designed for John Deere combine harvesters, provide a strong airflow to clean the knotter table. For long working days in the field, the newly designed and fully sealed twine box accommodates up to 30 twine spools in a single row. This facilitates the handling of the twine, which is easy to route and connect. The new L1500 Series large square balers are ISOBUS compatible and offer a wide choice of John Deere in-cab displays. Most adjustments such as bale length and density, knife activation and greasing system management, as well as knotter tracking, can be controlled directly from the cab. Maintenance is also much simpler, with wide opening machine shields, LED lights which illuminate key service points inside the baler, and an easy-to-access service platform.